Skin conditions are often an issue with bed-ridden patients in care homes, so that UV lights & magnifiers are essential items of equipment. Care Shop is the leading supplier of high quality medical products and this extends to the range required for thorough dermatological examination. Dermlite manufacture a wide range of UV lights & magnifiers that are used with confidence in a variety of clinical environments to examine and diagnose skin conditions. Dermlite Lumio ensures the glare-free and in-depth skin image that is necessary for the examination of many conditions such as pigmented skin lesions. 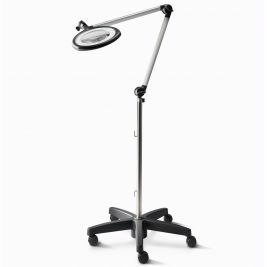 Brandon Medical offers the Optica 488 magnifying lamp that, among its many features, has a head rotation of 180º. Together with a 22 watt fluorescent light, this allows for greater angles of sight and a cool, natural light during intricate procedures. These lamps come with a desk clamp, a castor base, or a wall bracket. Optica 288 replacement bulbs are readily available. UV Lights & Magnifiers There is 1 product.